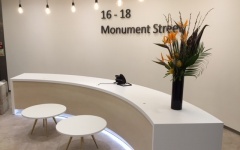 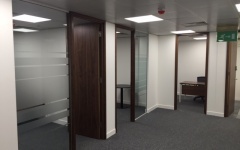 Prospect Business Centres provide specialist high quality serviced office accommodation. 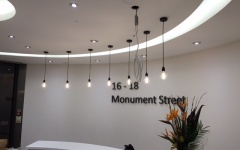 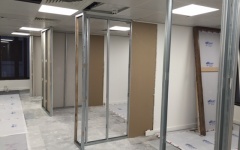 We are currently working on some offices in Monument! 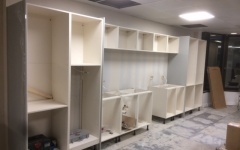 Check out how the project is coming along! 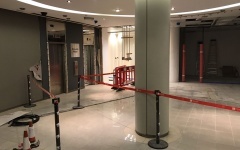 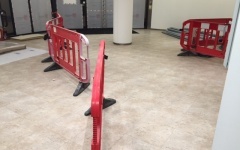 Pedestrian routes on ground floor after demolition. 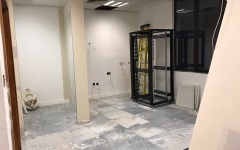 Ground floor comms cabinet arrived and ready for installation. 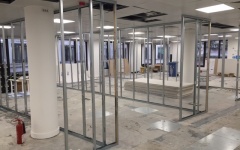 4th Floor data being installed. 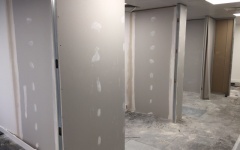 Taping and jointing to the 4th floor executive rooms. 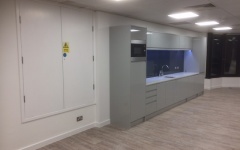 Teapoint installed on the 4th floor. 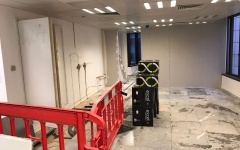 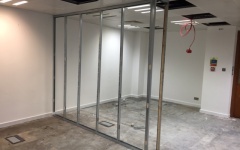 Ground floor comms partition with glazing installed as well and tape and jointing started. 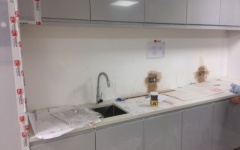 4th floor tea point installed. 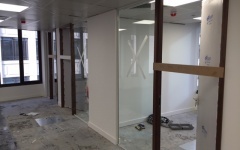 Glass partitions to boardroom on 4th floor. 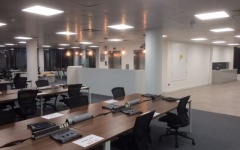 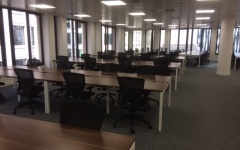 Open plan office furniture installed on the 4th floor. 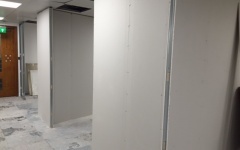 Storewall and lockers installed on 4th floor. 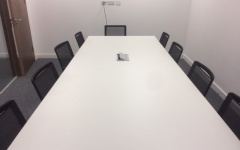 Meeting table installed on 4th floor. 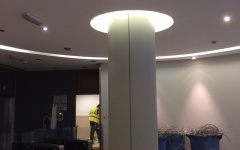 Decorations complete and entrance lighting feature on 4th floor. 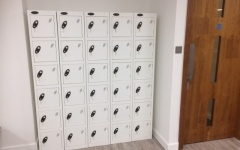 Mid height storage units installed on 4th floor. 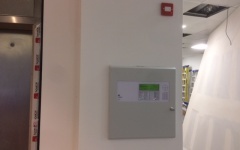 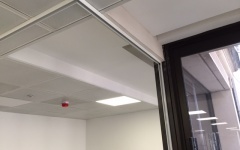 Fire alarm panel installed on ground floor. 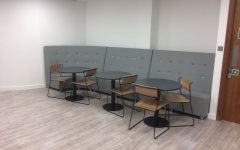 Break out seating table and chairs installed on 4th floor. 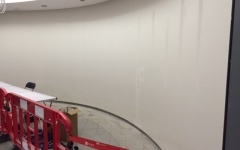 Curved wall on ground floor has been re-lined. 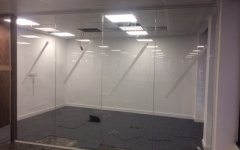 Glazing track installed for the 5th floor boardroom. 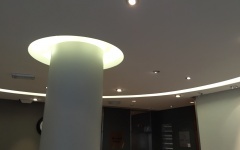 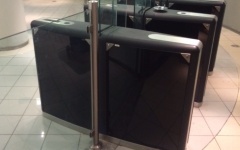 Entrance curved wall decorated on ground floor. 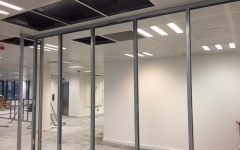 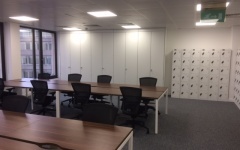 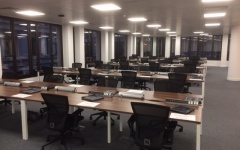 Meeting rooms on the 5th floor installed with doors and glazing. 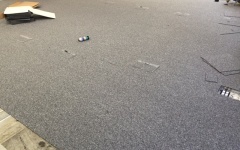 Carpet being installed on 5th floor. 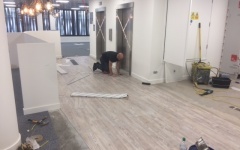 Vinyl on 5th floor being installed. 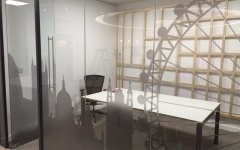 5th floor executive room extension. 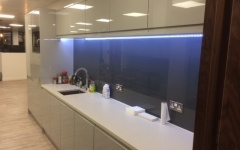 5th Floor tea point installed. 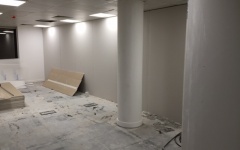 Prep work to ground floor. 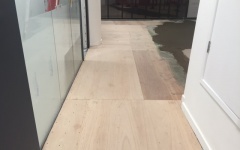 Ground floor ply being laid in preparation for the flooring to be installed. 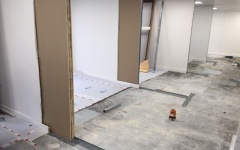 Ground floor ply being laid in preparation for flooring install. 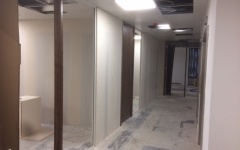 Executive rooms on the 5th floor now boarded. 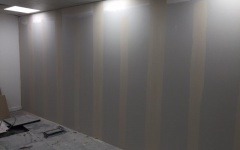 Tape & Jointing underway on 5th floor executive rooms. 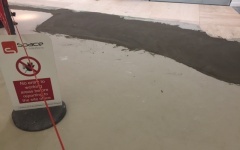 Ground floor flooring prep continued. 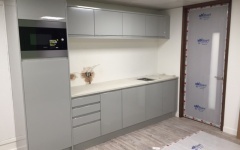 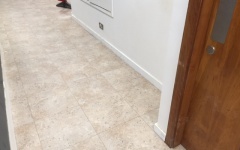 Ground floor tea point install. 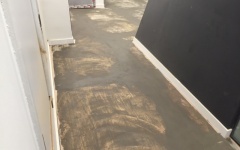 1st Floor stud being installed. 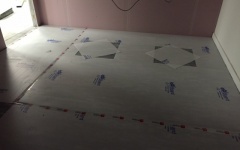 2nd Floor stud being installed. 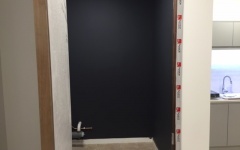 Ground floor disabled toilet decorated and ready for installation. 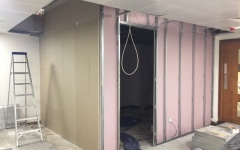 3rd floor stud being installed. 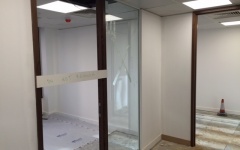 5th Floor glazing being re-installed. 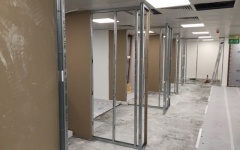 3rd Floor partitions ready for tape & jointing. 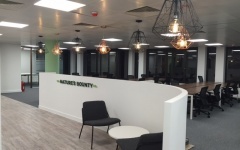 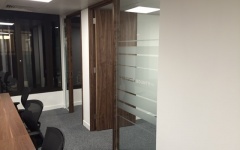 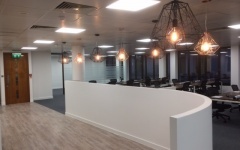 Ground floor timber feature, furniture and glazing artwork installed to meeting rooms. 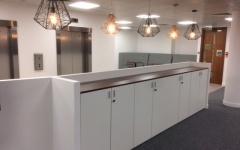 Ground floor reception desk installed. 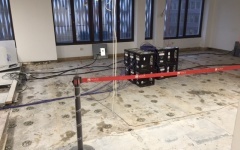 Data cabling being installed in access flooring on the 3rd floor. 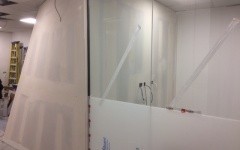 2nd Floor comms room being installed. 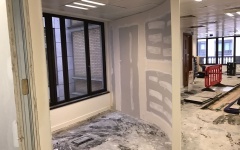 Taping & Jointing to 1st, 2nd & 3rd floors. 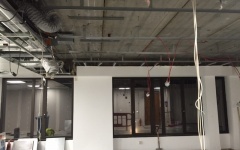 Section of 3rd Floor ceiling grid removed to be newly installed. 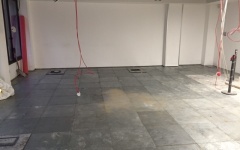 2nd floor comms room flooring laid. 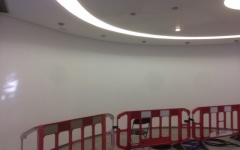 1st & 2nd floor tea points being installed. 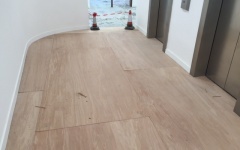 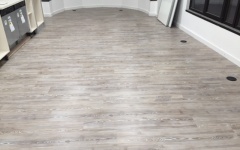 3rf Floor raised access flooring installed. 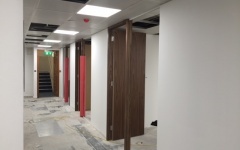 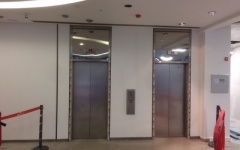 Doors and glazing track installed to floors 1-3. 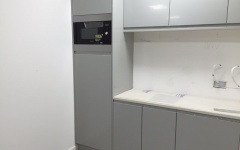 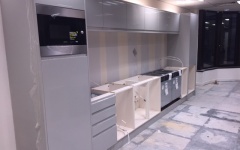 Tea-Point units being installed on 3rd floor. 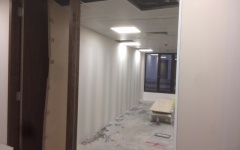 Doors and glazing track in along main corridor on 3rd floor, ready to be decorated. 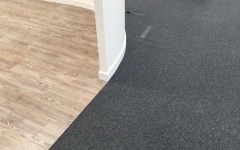 Vinyl installed to tea point area on 1st floor. 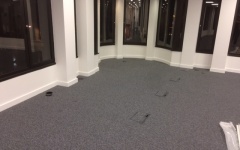 Carpet installed to 1st floor. 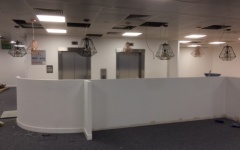 Decorations to the 2nd floor comms room. 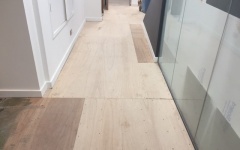 Ply laid and prepped for vinyl install on 2nd floor. 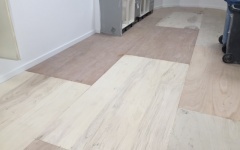 1st floor tea-point and flooring all complete. 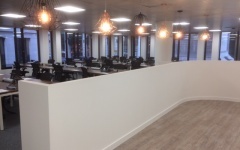 1st Floor following furniture install. 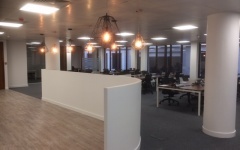 2nd floor lights installed and furniture in. 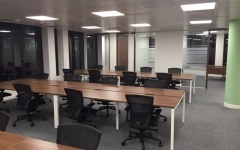 2nd floor following furniture install.